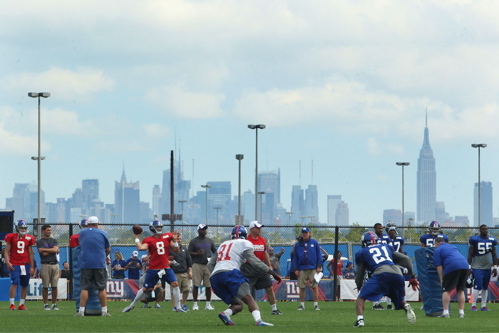 August 8, 2013 New York Giants Training Camp Reports: The Giants held their eleventh training camp practice on Thursday afternoon at the Quest Diagnostics Training Center. The next practice is on Monday from 1:30-3:45PM. For a complete training camp schedule and Giants.com Q&A guide, see the Training Camp section of the website. Injury Update – Many to Miss Steelers Game: Not practicing on Thursday were DE Justin Tuck (back), OL Justin Pugh (concussion), OL James Brewer (concussion), RB Ryan Torain (concussion), S Cooper Taylor (hamstring), FB Henry Hynoski (PUP – knee), DE Jason Pierre-Paul (PUP – back), and DT Markus Kuhn (PUP – knee). Tuck might play against the Steelers on Saturday night, but the others will not. OG Chris Snee (hip) and CB Terrell Thomas (knee/hamstring) practiced on a limited basis. Coughlin said they will not play against the Steelers. Head Coach Tom Coughlin’s Thursday Press Conference: The transcript and video of Head Coach Tom Coughlin’s press conference on Thursday are available at Giants.com.